Upright: Control, willpower, success, action, determination. Reversed: Self-discipline, opposition, lack of direction. The Chariot Tarot card shows a brave warrior standing inside a chariot. He wears armour decorated with crescent moons (representing what is coming into being), a tunic with a square (the strength of will) and other alchemical symbols (spiritual transformation). The laurel and star crown signals victory, success and spiritual evolution. Although he appears to be driving the chariot, the charioteer holds no reins – just a wand like the Magician’s – symbolising that he controls through the strength of his will and mind. The charioteer stands tall – there’s no sitting down for this guy, as he’s all about taking action and moving forward. Above his head is a canopy of six-pointed stars, suggesting his connection to the celestial world and the Divine will. In front of the vehicle sit a black and a white sphinx, representing duality, positive and negative and, at times, opposing forces. Note how the sphinxes are pulling in opposite directions, but the charioteer uses his willpower and sheer resolve to steer the chariot forward in the direction he wants. Behind the chariot flows a wide river, symbolic of the need to be ‘in flow’ with the rhythm of life while also charging ahead toward your goals and intentions. 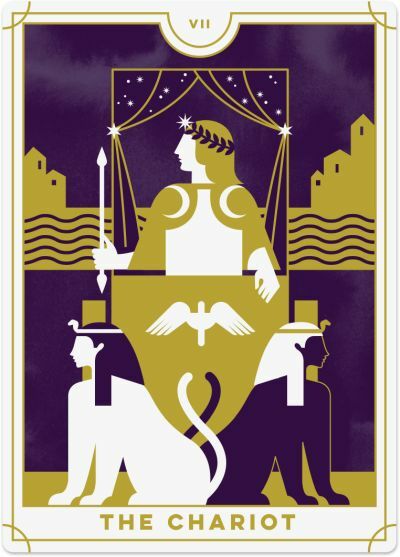 The Chariot is a card of willpower, determination and strength. You have discovered how to make decisions in alignment with your values with the Lovers card, and now you are taking action on those decisions. When the Chariot appears in a Tarot reading, take it as a sign of encouragement. You have set your objectives and are now channelling your inner power with a fierce dedication to bring them to fruition. When you apply discipline, commitment and willpower to achieve your goals, you will succeed. Now isn’t the time to be passive in the hope that things will work out in your favour. Take focused action and stick to the course, no matter what challenges may come your way – because, believe me, there will be challenges. You may be pulled in opposite directions and find your strength and conviction tested. Others may try to block you, distract you, or drag down the pursuit of your goal. But the Chariot is an invitation to draw upon your willpower and home in on what’s essential to you, so you can push past the obstacles in your way. If you are curious about whether you have what it takes to achieve your aim or complete an important project, the Chariot is a sign you will be successful so long as you keep your focus and remain confident in your abilities. You need to use your willpower and self-discipline to concentrate on the task at hand. You can’t cut corners or take the easy route, or you will fail. Instead, see this endeavour as a test of your strength and conviction, and recognise that victory is within reach, but it’s up to you to follow through. The Chariot calls you to assert yourself and be courageous. Be bold in expressing your desires and laying down your boundaries; otherwise, you will not get your way. You need to have faith in yourself and know fundamentally who you are and what you stand for (thus building off the personal belief systems and values established through the Lovers card). In a very literal sense, the Chariot can represent travel, especially driving or taking a road trip. You may even be considering selling your home and buying an RV so you can head off and roam the country! Upright, the Chariot is a green light to move ahead with a key project and push past any obstacles that might impede your desired outcome. Reversed, however, the Chariot tells you to ‘back up the truck’ or, as we Aussies say, “Chuck a U-y” (AKA “do a U-turn”). You might bang your head against a brick wall, trying to push a project forward when really, you ought to back off or change direction. Or you might have lost your motivation and no longer feel as committed to the outcome as you did when you started. So, if something is not moving forward as you planned, re-evaluate the situation and check in to see if it’s a sign that you need to change course. Then ask yourself: Is there a deeper reason things have become more challenging? What lesson can I learn here? At times, the reversed Chariot is a warning that you are letting obstacles and challenges get in the way, preventing you from achieving what you set out to do. It’s all getting too hard, and you don’t have the will to go on. If that resonates, stop for a moment and think about the things that matter most to you and why you want to achieve this goal. Will you allow other people’s opinions to sway you or give up as soon as the going gets tough? Or will you follow through on your commitment? Before taking action, the reversed Chariot may be a hint that you are focusing your energy and attention on your internal processes, such as self-discipline, inner determination and personal commitment. You may home in on the intentions that align with your Higher Self. 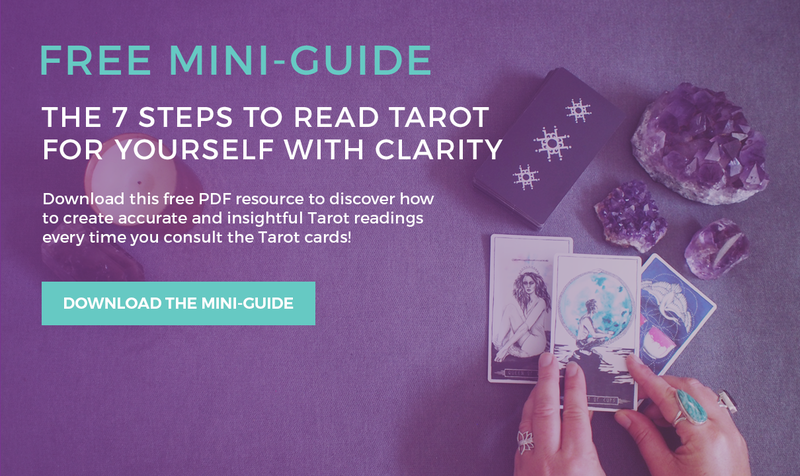 Or, you can use visualisation and meditation to make sure your energy aligns with your goals. These internally focused actions are essential so that when the time comes to act, you will be ready. If you are someone who likes to have command over your destiny and know where you are heading, take this opportunity to tighten the reins and become more disciplined in what you are doing. While feeling a loss of power can be quite demoralising, the key is to look at what you can control and what you cannot. Do not allow yourself to worry about what is out of your grasp as you cannot change it now. Instead, focus your energies on what IS in your control. Examine what you can do to improve the situation. 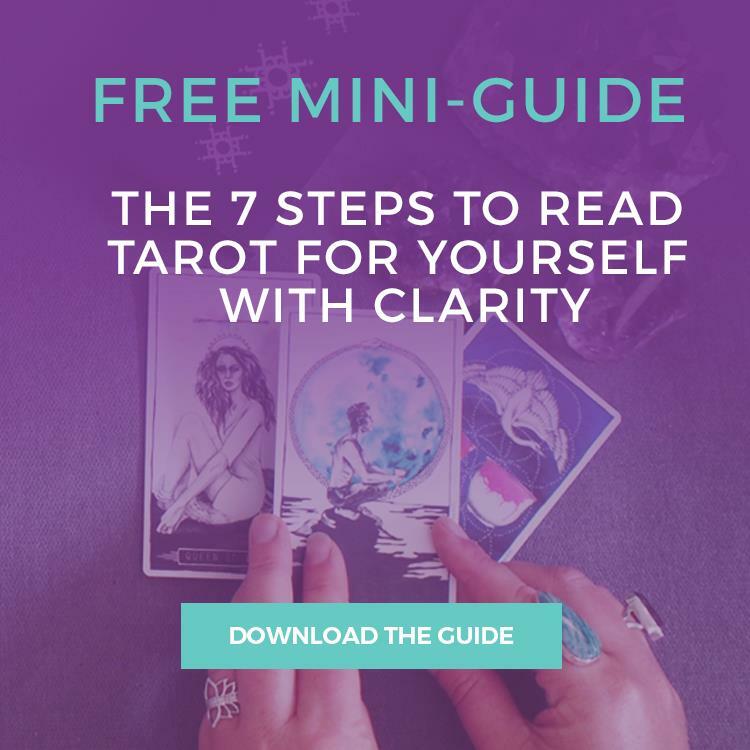 Similarly, the Chariot reversed suggests that you may be trying to manage every minute detail in your life – but in doing so, you feel even more out of control. Loosen your grip and let things run their course. Be open to offers of help and then be grateful for what you receive, even if it’s not perfectly aligned with your expectations. You do not always have to be in the driver’s seat!